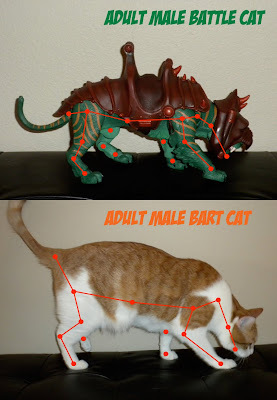 As you can see from this diagram, Battle Cat's joints are consistent with actual joints from a cat. 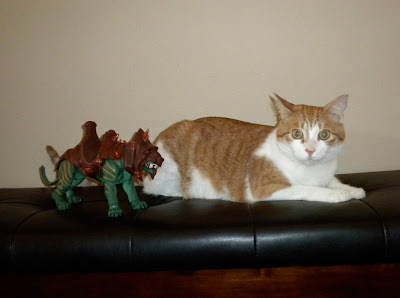 As you can see here though, Battle Cat is not scaled to his real Green Tiger size, but to 1/3 house cat scale. Ouch! 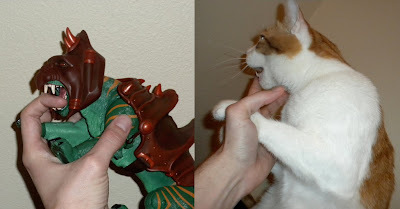 As you can see here, both cats have sharp teeth. Tune in tomorrow for the Science between Dan and He-Man. Wait, I have to wear what? I have to lift what? I have to defeat who? Tomorrow's science between Dan and He-Man will be cancelled. 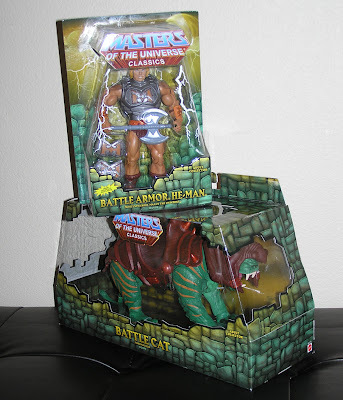 Here's a long, rambling, incoherent, sloppy camera worked, badly cropped, annoying autofocus sound, and poorly choreographed opening of He-Man and Battle cat toy review! 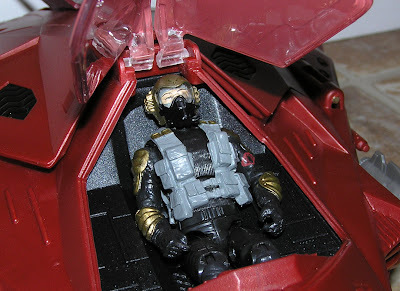 A pretty cool toy. They look so authentic to the original show. 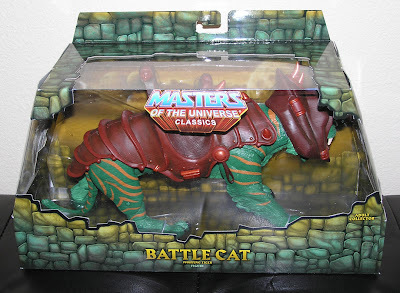 Battle Cat might be a bit too large, as his joints give in a bit. He-man sits kind of funny too on him. 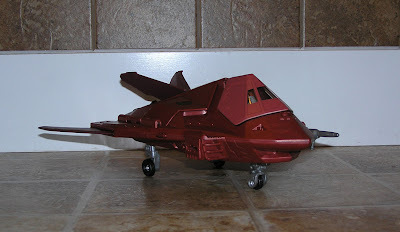 Overall though, probably top ten toy ever made. OH THE TURMOIL! Surely this is some sort of mad plot by Skeletor! 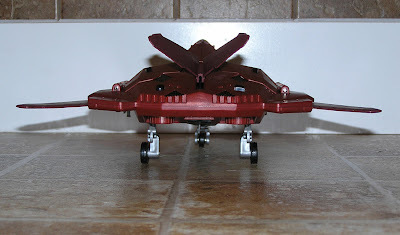 I just watched a few reviews of this toy on YouTube. 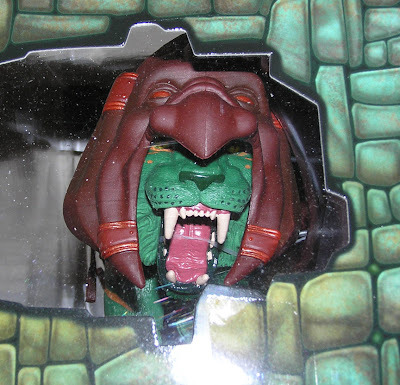 Mainly by the awesome people at He-Man.org Now I really want to do it... must open...RESIST...open...no... AUUUUUGHGHGH. I did think up some new logic. 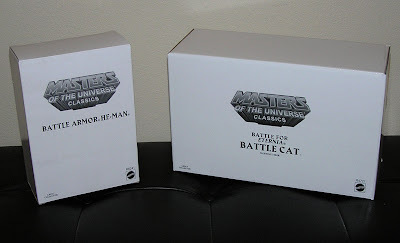 Yes the main packaging will be mostly destroyed in openation, ...but if I can use the original packaging box to hold both figure and damaged package inside, the value won't be that much more destroyed? And isn't a toy that has been 'tested' and approved 'play worthy', more valuable? Finally a mount for He-Man! 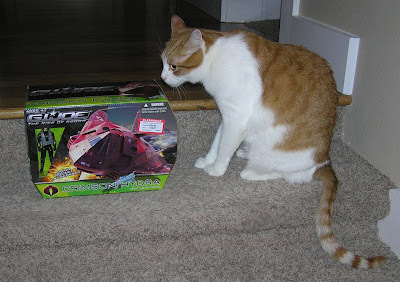 Oh man, these toys are too expensive for me to want to open yet. 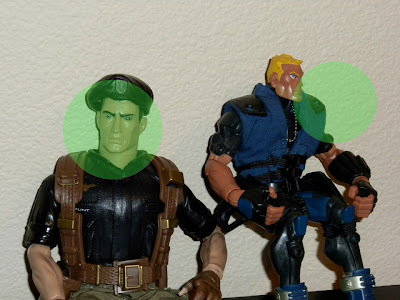 Stupid Mattel. I really really want too, but then its like taking a couple 2o's and tearing them into pieces. The turmoil inside me! 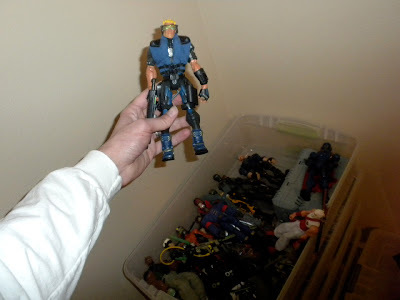 I don't want to look back in five years with a Tub full of very expensive He-man toys now smashed together in a lump of plastic. 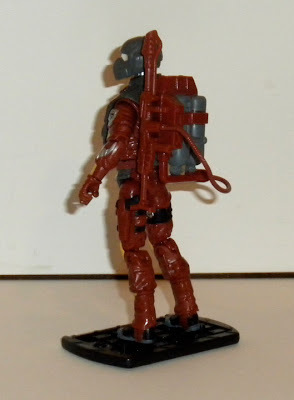 And I just know Mattel is going to jump to 3 3/4 size once they exhaust this line. 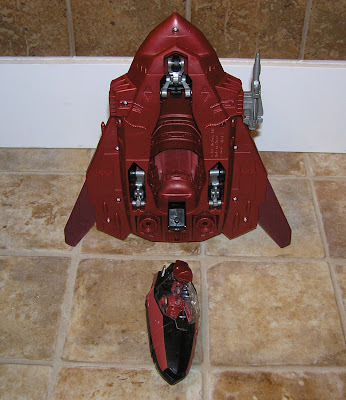 How cool would it be to have 3 3/4 scale of He-man toys! 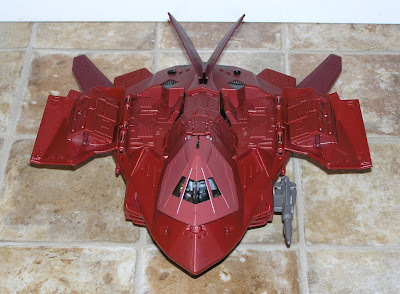 Ready to be bombarded with the Oh So Awesome Cobra Crimson Hydra images? 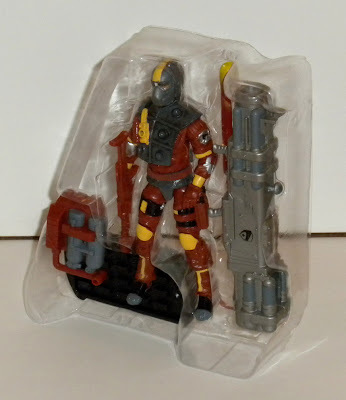 I found one on clearance for ten bucks would you believe? Such a beautiful craft, I am surprised it didn't sell better. Of course, I didn't buy one at full price either. 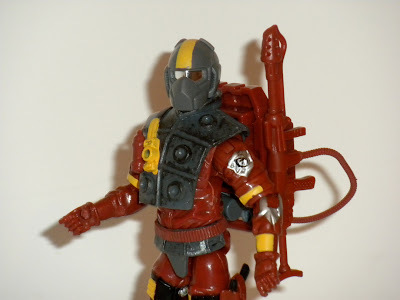 Its a repaint of a former series, Spy Troops, and then Valor vs. Venom. I can't believe I didn't buy it when it was in Stealth Black. That was a no brainer miss fire for sure. 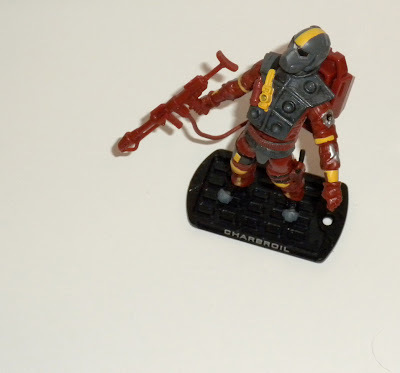 The red version is just as cool, and it fits perfectly with my Crimson Guard collections. 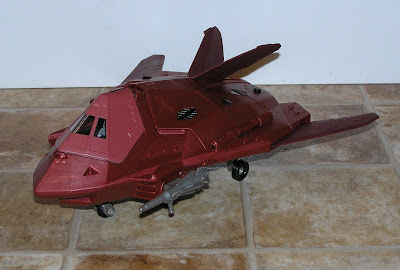 The back wings slide out so that it can fit in the packaging. 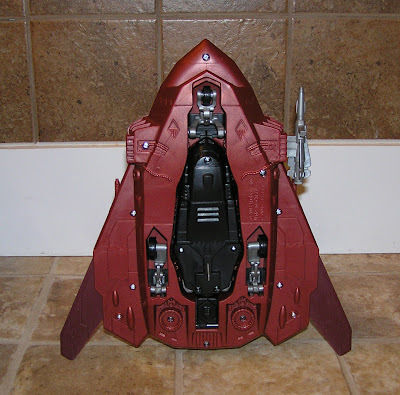 The top opens out for stabilizing and to reveal rocket launchers. 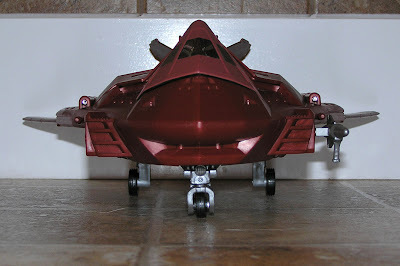 The Aero-Viper is so-so, has some neat gold detailing. 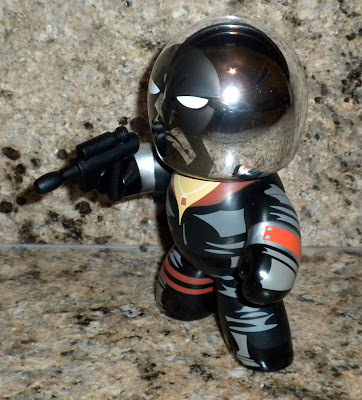 I just noticed his helmet is removable, that bumps him up an extra star, looks to be a Firefly like head under there. Now for the gimmick! An underbelly bomb? 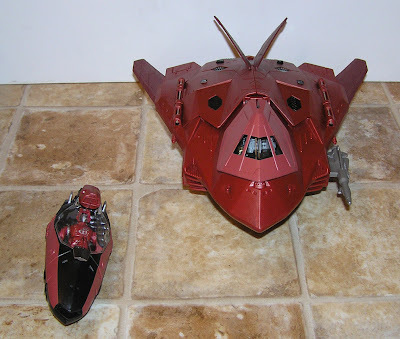 No, a mini ship pod! 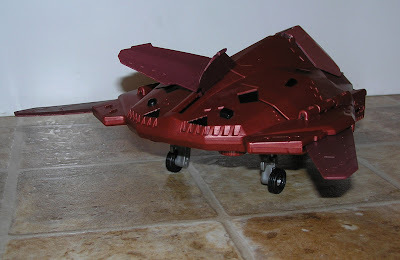 Or a bomb with a pilot in it! 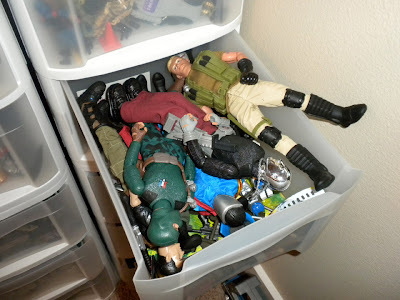 Cobra has so many expendable men. So yeah, if you can find one, pick it up. It is one of the better vehicles I have run across in a while. Damn, the bathroom floor is a great studio. Very nice shots coming out of the old steam digital camera. Kind of bored tonight, so went to the store for some supplies. 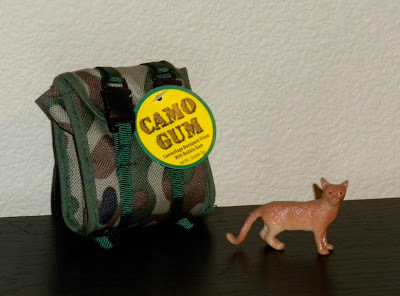 Found some Camo Gum. 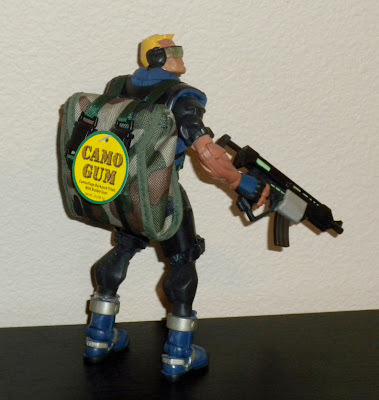 Hmm wonder if one of the GI Joe's could pack it? Duke. 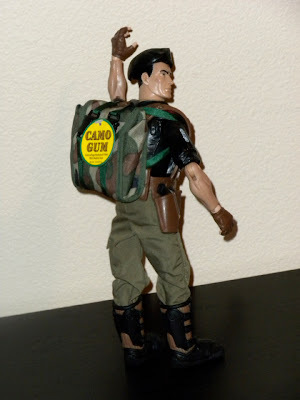 He liked gum in the movie too. 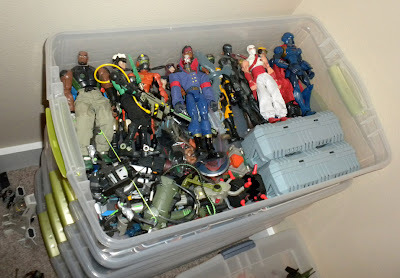 Lets dig through the 12" Dolls... 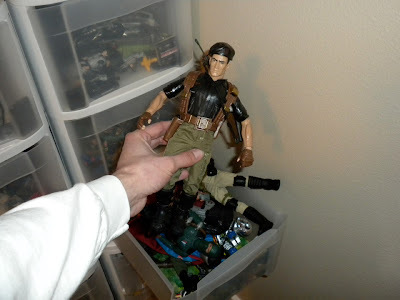 I mean, poseable action men. Ah, Flint will do. Duke can carry the pack, but its a little droopy. 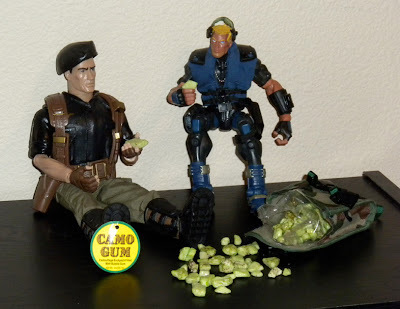 So what kind of gum is this? Looks like green rocks? Any good? The Joe's seem to like it. It does stick to your teeth though. 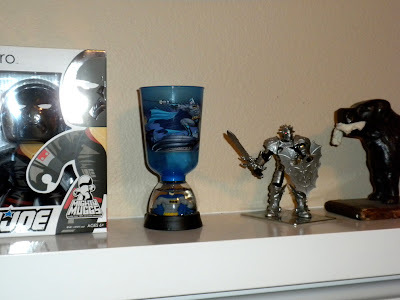 What does a Blue Ranger with Cats, a Governor's signature, an XBox 360 and a Batman Trophy all have in common?! My better half got me an XBox 360 for Valentines day! How awesome is that! I love it, finally i can throw down the shackles of the Game Cube and enter the year 2000! 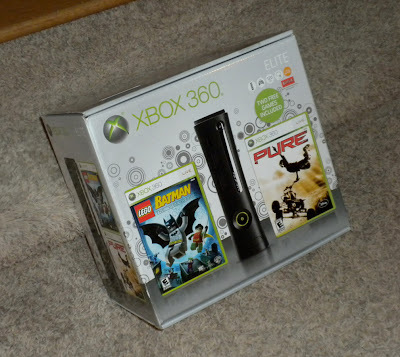 It came with Lego Batman, which is awesome since I have many of the Lego toys designed for that game. Also a spiffy racing ATV game, with complicated horrific crashing tricks. Also the island from Lost called to me, as I found the game on clearance for under 10 bucks. I spent last night wandering through the jungle chasing Vincent, finding the wrecked plane, photographing my flashbacks, and falling in a hole in a dark cave. The Batman Cup was a trophy given to citizens of the city for doing outstanding feats in the field of excellence. 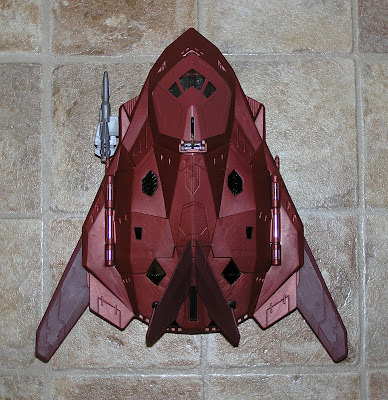 I really liked the design, thought it would look good on the mantle. Hey it was only 1.99 at the Grocery Outlet! I was trying to figure out why the designers of the cup placed a sparkle snow globe with Batman on the base. Wouldn't that result in spilling the drink all over your pants. BUT GUESS WHAT, this gets better, I was at a friends house this weekend. Turns out his daughter had one too, but with a pink Disney Princess on it. AND WHAT?, it had a top with straw... ITS A SIPPY CUP! Well I like my Batman sippy cup trophy on the mantle where it is! 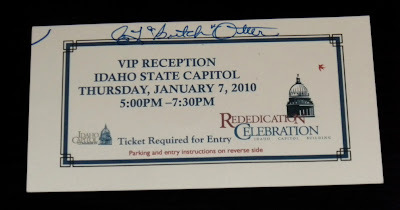 I managed to corner our great State of Idaho's Governor into a corner and get his signature durning an evening event I was invited too. Thats right, this blog has friends in high places, so you better watch out! 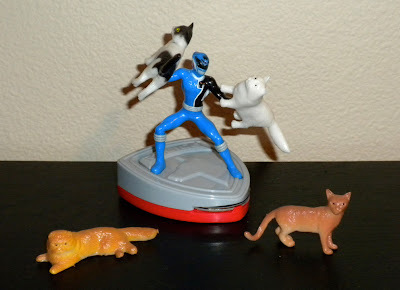 What is the Blue Ranger doing with these cats you ask? Or what are these cats doing with the Blue Ranger I ask? 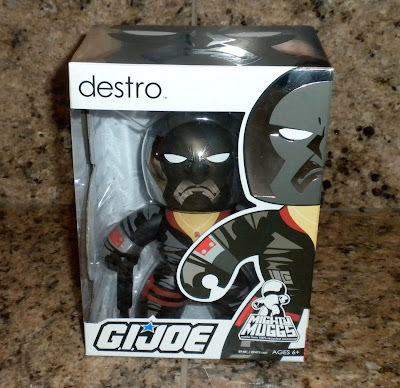 This Just In: Destro's Head is Shiny! 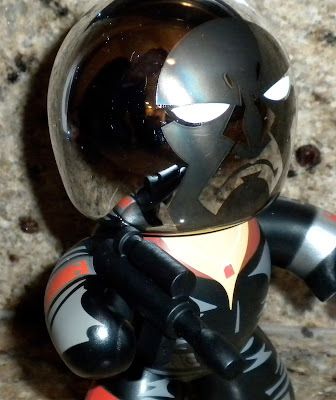 From the initial online photos of this guy, I thought his dome would be matte sparkle gray finish. When I was walking down the aisle at the store though, the piercing reflection from the Iron Mask sent me squinting. 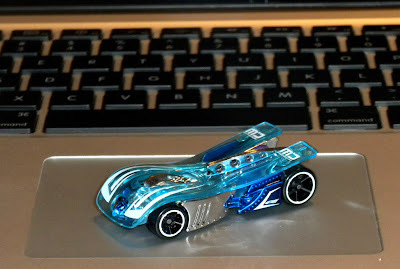 That chrome is the most reflective I have ever seen in a toy. White glove holding of course or it will be full of finger prints fast. You can almost see me in the reflection! 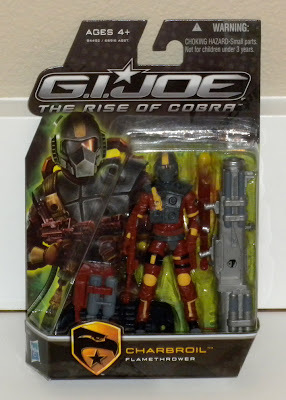 GI Joe; The Rise of Cobra, Charbroil fix me Dinner! I planned to be done with this line, but Charbroil was darn near perfect. Okay the shiny chrome mask got my attention big time. 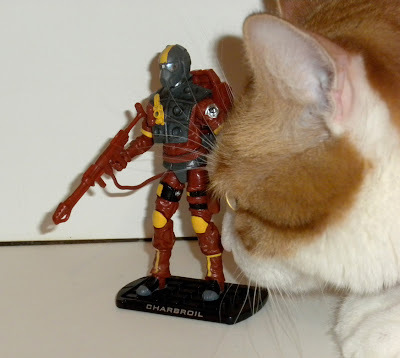 Most GI Joe movie toys came out feeling very similar to one another, while Charbroil is in his own. Looks like Bart is too drawn to the shininess of the helmet. Or maybe his knees. It's Charbroil, and he's darn near perfect! No, this is not the winner! This is just a friendly reminder that I will be opening the Hot Wheels Mystery Car probably Wednesday night, so don't forget to vote. So far, seven measly votes have been placed! Well actually those votes are triumphant, its the votes that have not been placed that are measly. Come on people, this is your chance to win a car! A car that is worth up to a dollar and nineteen cents in some locations. Just guess what is inside, and if you are closest, you get it sent to your location. Remember that you can research a possible insider too, and that its early in the year so the list isn't too long yet. Of course you never know until you vote. 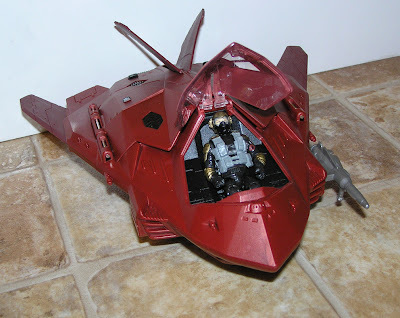 By the way, how about todays random car, the Motoblade? I like to call it the Mouthwash myself because of its pretty clear blue cover.